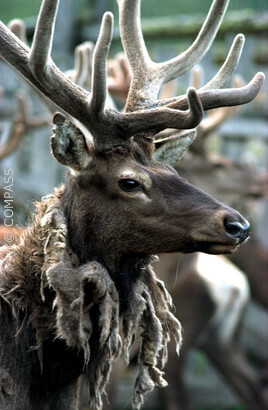 Altai Republic, Russia, 2005 A maral deer wearing proud antlers and a shedding wintercoat, both of which grow back again every year. In Southern Siberia, at the heart of the Altai mountains, thousands of maral deer live in gigantic protected reserves. For centuries, every spring, their velvet antlers have been cut off in a bloody ritual to provide the Koreans with a natural sought-after aphrodisiac. Throughout an entire year in Russian Altai, Red Velvet recounts the fate of the maral deer and follows the unlikely journey of their antlers to South Korea.